This article shows how shortcuts can be created and managed in documents (such as PDF, Word, and so on) and in scripts with Microsoft App-V. New shortcuts for websites (URLs) can be created directly with the App-V Management Server, that are then inserted into the Start menus of certain AD groups. The applications run outside the virtual environment, since one leaves “the bubble” through the local scripts. 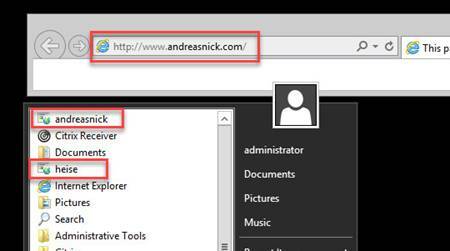 In Citrix XenApp 6.5 there is shortcut management for documents, web links or even scripts. This means that it is possible in the System Management for XenApp to create a shortcut and then later to have this shortcut automatically be made available in the Start menu or even in the Citrix web interface (now Store Front). This function is no longer available as of XenDesktop 7.x. One of our customers had a whole pile of shortcuts and the requirement to integrate them somehow in the new XenDesktop 7.9 with App-V. 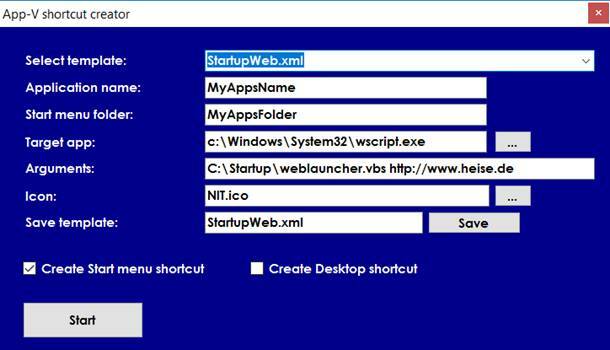 In short, we found a solution with App-V to manage the Start menu shortcuts and applications. The prerequisite for this is the App-V Management and Publishing Server, in order to authorize shortcuts for groups. With an App-V sequencing, a shortcut (or desktop shortcut) to this file will be created. Depending upon whether the batch file MyScript.cmd is located on the client system or not, the shortcut must be created differently when this shortcut app is published with an App-V client. The link is generated for the virtual file system, because the App-V client cannot recognize the local file.This scenario will not work at all, because the file or script is not located in the package. This is an automatic function of the client. Thus a shortcut is generated to a local file (the script) with a /appvve: parameter. The script is then started in a virtual environment. However everything that is started in the external script ends up outside of it again. For example, when notepad.exe in the script is started with “Start Notepad.exe”. “Get-AppVVirtualprocess” won't show any running virtual applications. The App-V Publishing Server creates a shortcut to the Desktop or to the Start menu with the publishing of the App-V application. Now it gets interesting. An App-V shortcut can also contain start parameters. We have here a short VBS script through which websites are made available. This functions exactly the same for all other types of documents. Wscript.echo "Command line arguments are required." Now a shortcut needs to be created again in the sequencing process. This time to “wscript.exe” and to the VBSScript. An additional parameter is the website to start. REMEMBER: the script (the .exe, myscript.cmd or other) in turn must be in the physical file system of the sequencer and the client. Otherwise it won't work. Here, it is wscript.exe and webstart.vbs. The VBS Script starts Internet Explorer with the desired page as the parameter. After publishing, the shortcuts appear in the Start menu. The start occurs finally in a virtual environment, although the /APPVVE: parameter is contained in the call. 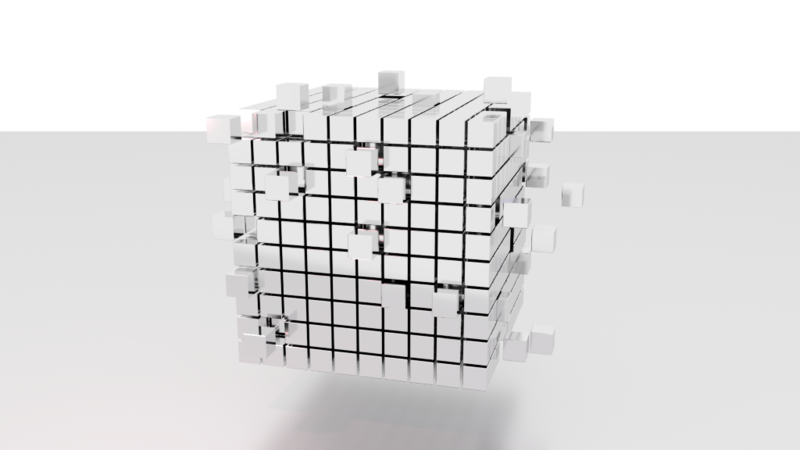 In the App-V Management Server it is easily possible to generate one or several shortcuts with different end addresses. And that simply with the “command line arguments”. After synchronizing with the App-V Publishing Server both shortcuts appear in the Start menu. Unfortunately not always with the same icon. One can possibly create App-V packages grouped by icon (for example an application package for all PDF documents in a company with the Adobe PDF icon). Since we have converted a great number of Citrix content apps, we have of course for this very purpose a functioning automatic conversion that works with techniques similar to our “XenApp Streaming to App-V Converter”. Please send me an email if you have a need for a tool or a service for converting Citrix shortcuts. The tool is started with a sequencer and automatically steers the sequencing process through the creation of a shortcut app. Thanks! Now I can make connection groups between 2 packages. Is it possible to create 2 shortcuts with this script? Like Production and Test in the same App-V package? Thanks! Now I can make connection groups between 2 packages. Is it possible to create 2 shortcuts with this script? Like Production and Test in the same App-V package? It's not that easy. You'd have to change the script. And the tool must be started on a sequencer! But you can create new shortcuts directly on the Publishing Server. There is a screenshot in the blog. Kinda late after 2,5 years but I am looking for a tool like App-V Shortcut Creator. Did you release it? And if so where can I download it? Kinda late after 2,5 years but I am looking for a tool like App-V Shortcut Creator. Did you release it? And if so where can I download it? And in all those years, nobody's asked for it. I didn't notice it. The download is now also in the blog. We just had the topic at the German App-V event M.A.D. Day (Modern Application Deployment) - I briefly presented the tool. The spectators only realized what this is good for and I had some follow-up dates :-) Have fun with it!